Last Updated May 30, 2010 Occupation More than I can put on this line! I've moved to DA please look at my pictures there!!! The stories of the no names. 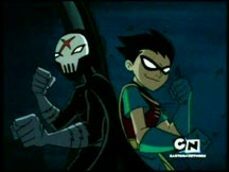 I little story with Beast Boy well being Beast Boy. Comments please and I take requests! Note: This won the contest! I'm so happy! Frist time ever that I won a contest here! This is the Teen Titans high school musical it has no relation to High School musical and I worte all original songs so enjoy! This is a fanfic I wrote for terry_titanqueen's pic. Enjoy! Some of these songs are villans and some Titans. If you don't like a song well flame! If you do comment! This is a fic about a few of my buddies from DA. In this fic you will see how uhm how should i put it,,,,,,,,, intense a simple game of Truth or Dare can be with these different personalities. As you all should know Rose and DP me are well Mine!! Wow! It's been forever! I've been well moved to DA and SA though really. Yeah, I spend most of my time on DA too....But I don't know what SA is.....? zomg hi meh fwend Frozy omg i havent talked to u in like *counts on fingers* Forever! ^___^ its nice to talk to u. you no i was just saying hi to my first best fwend on Fac! *glomps u* ur da besht^^ bu bi!